Lindy LDAC-Pro review | What Hi-Fi? 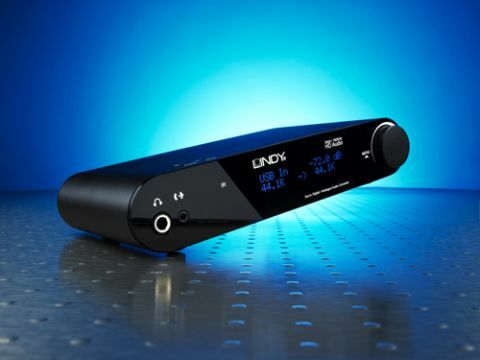 If there was a prize for the most connections and features found on a DAC - this Lindy LDAC-Pro would win out easily. German company Lindy is more known for producing connectivity accessories such as cables, splitters and power plug adapters, but they also make small and affordable DACs - which makes this £350 LDAC-Pro a departure from its usual repertoire. At £350, it’s an expensive DAC. Largely, we think, to take account of the plethora of features and connections that can be found packed at the rear panel. Let’s start off with the digital connections: coaxial input and output, optical input and output, a type B USB input (which will handle 124bit/92kHz files natively), and one HDMI input followed by an HDMI output. On to analogue, there are two pairs of line level RCA - again, one input, the other output - and there’s even a pair of XLR output connections. On the front panel, a 6.3mm headphone socket sits next to a 3.5mm line level input, while the power and mute buttons sit on the top of the box. Cosmetically, the mains-powered Lindy is a hefty and solidly built box – it won’t rate high in the portability stakes, and will warrant shelf space. It comes finished in black, and rather unusually for a DAC, it has a front panel display. The display shows the input source, the sample rate of the file playing, and the volume – that’s quite a lot of information to pack in, but it’s clear and easy to read. Go into the menus, and you have the options of choosing the input source, the sample rates (we preferred to keep it on bypass for native resolution), headphone impedance, and switch between the fixed or variable volume control. Scroll and select using the Lindy’s rotary volume control. And to round off the list of features, the Lindy even comes with a remote, which comes in useful when you have multiple input sources to switch between, and of course for adjusting the volume. So after all that, does the sound quality match up with this dazzling list of features? Well, not quite. Stream a 24-bit/192kHz recording of Ble Bleezing Blind Drunk by The Unthanks over the coaxial input, and the Lindy delivers clean and clear notes, along with a good amount of weight and solidity to the sound. There’s a decent balance across the frequencies, too. But there’s little hint of any subtlety in detail or dynamics (particularly in the rather one-dimensional treble) – crucial to fully conveying this bleak and haunting song. The nuances in Rachel Unthank’s unusual vocals are lost, and there’s little depth to the layers of music, which makes it difficult to connect with the music. Use the Lindy directly as a preamp, however, and there’s a touch more dynamism. The Lindy delivers the bare bones of a track, but without much involvement in the melody or emotional content of the song. Not to hammer it home, but it does feel like the Lindy has no joy or interest in the music it’s playing, leaving the listener little to engage with. Play The Noisette’s Don’t Give Up (WAV recording, USB input) and it’s clear part of the Lindy’s laidback sound is due to its timing. The funky, upbeat song demands a fast and razor-sharp precise sense of timing to keep the song’s hectic momentum going, and the Lindy falters at this point. The Musical Fidelity V-DAC II has a lighter sound and Micromega MyDAC and Audioquest's DragonFly are a touch on the hard side – but all those DACs have good timing on their side to keep things lively and interesting. In the end, the Lindy’s flat and un-engaging sound fails to delivering a convincing performance, despite having all the connections you’ll ever need. And at £350, this Lindy really needed to have delivered something with a wow-factor, but its sound quality doesn’t match up against cheaper and much more talented rivals.